What should be observed when providing aftercare following surgery on De Quervain´s syndrome? Is one allowed to shower after surgery? When do the stitches come off? Is physiotherapy going to be necessary after surgery? When will the hand be fully operational? Dressing during the first days after surgery on De Quervain´s syndrome. Hand and forearm should be dressed in such fashion that all fingers and the thumb retain their mobility. At the same time the wound located close to the wrist has to be protected properly. The treating physician will check the wound and renew the dressing at regular intervals. I encourage patients to please move the hand that underwent surgery! You should stretch your fingers and the thumb immediately after surgery. Move your fingers and thumb of the hand that had surgery but please do not put any strain on it during the first two to three weeks. As a rough guideline: you should not lift anything that weighs more than a cup of coffee. Whatever you do, it is important to keep the wound dry and clean for as long as the stitches are in place. There are protective covers which you may use to shower. Alternatively, you may use two plastic bags which you pull over the operated hand and secure at the forearm with a large band aid in order to keep any water from flowing towards the hand. Usually ten to fourteen days after surgery, as long as the wound healing process proceeds well. Removal of stitches after the wound has healed. Pulling the stitches in the case of a well-healed wound is very simple and does not represent any more discomfort for the patient than just a slight pulling sensation to the wound. 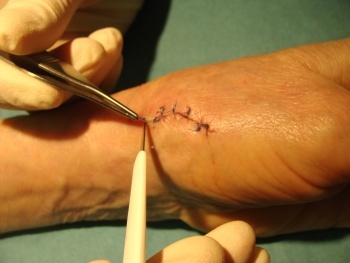 Using a disposable scalpel has proven to be a very gentle approach when removing stitches from a hand. It is however also possible to use scissors and tweezers. The “pull” experienced by the patient is then typically perceived as slightly stronger. 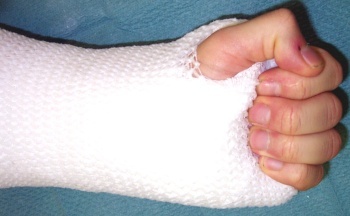 The image shows the removal of stitches (not following a procedure on De Quervain´s syndrome but on anther hand surgery – surgery on a thumb saddle joint). What has been said about pulling stitches remains, however, unvaried. In isolated cases it may be appropriate. This may be the case if the mobility of the fingers, thumb or wrist is far less than average and any independent exercise activity does not lead to any palpable progress. One to two days after the stitches were removed you may move your hand in warm water. A proven strategy would be to do this over the first six to eight weeks three x five minutes per day. It is also recommendable to care for the operated hand and particularly for the scar by applying an oily ointment. This will take approximately six weeks. At this time the scars probably will still feel a little sensitive to the touch which is quite normal. (The high level of sensitivity is explained by the vicinity of the scar tissue to the closely located radial nerve or its branches).